The best way to review this film is to say that it's perfectly weird. And in the best way. From the moment the movie starts with it's dark discordant music that washes over the slow and intimate scenes of family home, you can only surmise that something is somewhat afoot. Written and directed by Ari Aster, in his feature directorial debut, it may seem like just a mere haunted house tale. The craftsman style home with it's rich wood, and clutterless rooms is like an additional character with it's odd dark corners and creaky floors. Then there is the lack of typical chaotic family yelling and screaming that lets you know, it's not quite normal around here. Toni Collette is Annie Graham an artist who works from home. She creates diorama's of carefully detailed miniatures of scenes in her home and other random buildings she is creating for an art show, in which she is behind schedule. She is married to Steve (Gabriel Byrne) the stoic and kindhearted father who can't seem to grasp his repressed family unit. They have Peter (Alex Wolff), a quiet and spaced out pot smoking teenager and younger daughter Charlie (Milly Shapiro) who spends most of her time drawing in her notebook and collecting odd bits and pieces. The family is grieving, but mostly kind of relieved by the passing of Annie's mother Ellen. Annie and Ellen had been estranged for a number of years. Annie explains to a grief support group that her father starved himself to death, her brother hung himself because he believed his mother was trying to put another person in his body, while Ellen suffered from dementia. So it seems to be expected some cray-cray is coming. It's best this movie is seen without anymore information, just lest it seep into your senses and linger in your memory. It's a well crafted supernatural drama, that doesn't go in for the laughable shock scenes that fill other films of this genre. It's a psychological study of how our family ties influence and affect your world. It would be great if one of the DNA tests that can tell your ancestry, can also tell how your linage has some genetic influence on your mental health issues. 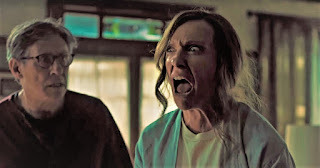 Everyone is outstanding in this, especially Toni Collette who seems to be just hanging on the threads of sanity for the sake of the family. Alex Wolff stands out the most as his facial acting tells the unsettling bigger story of what this young man has to endure.